The National Shooting Sports Foundation (NSSF), the trade association for the shooting industry, is severing its ties with British-based Reed Exhibitions. On May 9th, NSSF announced that it has reached an agreement with Reed Exhibitions to terminate the contract the parties had for the management of the SHOT Show. Accordingly, effective immediately, Reed Exhibitions will no longer be manager and producer of the SHOT Show. NSSF is now actively engaged in the process of identifying a new show management company to manage and produce the SHOT Show beginning with the 2014 SHOT Show in Las Vegas. 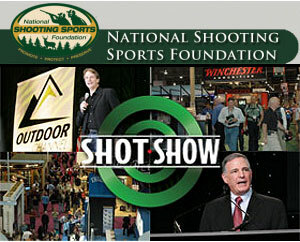 The SHOT Show — the Shooting, Hunting and Outdoor Trade Show — is owned and sponsored by NSSF. It is the largest and most comprehensive trade show for all professionals involved with the shooting sports, hunting and law enforcement industries. The 2014 SHOT Show will be held January 14-17 at the Sands Expo and Convention Center in Las Vegas. 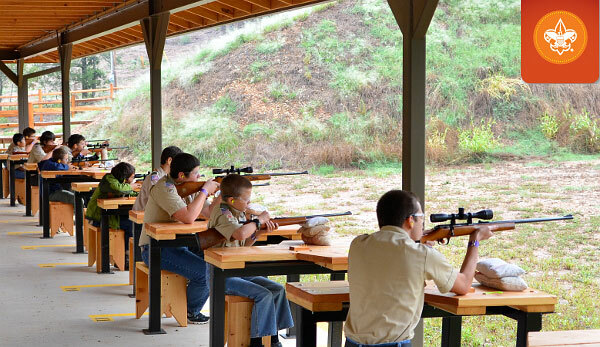 Share the post "NSSF Splits with Reed, Seeks New SHOT Show Management"
In cooperation with the Youth Shooting Sports Alliance (YSSA), Federal Premium Ammunition and sister company CCI have allocated 20 million rounds of rimfire ammunition to youth shooting sports programs. This will be sold at a discounted price, well below market value. The Boy Scouts of America will receive ten million .22 LR shells, and another ten million will be sent to other organizations. The Federal and CCI rimfire ammo will ship directly to the Boys Scouts of America, 4-H Shooting Sports, Scholastic Steel Challenge, and other qualified youth organizations. The ammo will ship later this month to ensure adequate supplies for summer camps and youth training programs. Share the post "Federal and CCI Allocate 20,000,000 Rounds for Youth Shooting"
Conventional .308 Winchester brass has a large primer pocket with a large, 0.080″-diameter flash hole. In 2010, Lapua began producing special edition .308 Win “Palma” brass that has a small primer pocket and a small flash hole, sized 1.5mm (.059″) in diameter. Tests by U.S. Palma Team members showed that the small-flash-hole .308 brass possibly delivers lower Extreme Spread (ES) and Standard Deviation (SD) with some bullet/powder/primer combinations. All things being equal, a lower ES should reduce vertical dispersion at long range. Why Might a Small Flash Hole Work Better? You can read more about this test and other primer experiments on RiflemansJournal.com. 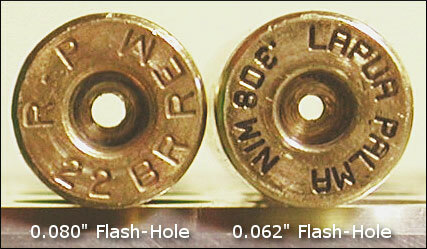 To isolate the effect of flash hole diameter alone, German set up a test with the two types of .308 case that have a small primer pocket: Remington BR brass with a 0.080″ flash hole and Lapua Palma brass with a 0.062″ flash hole. NOTE: German reamed the Lapua brass to 0.062″ with a Sinclair uniforming tool, so it was slightly larger than the 0.059″ factory spec. The Remington brass has a .22 BR headstamp as this brass was actually meant to be re-formed into .22 BR or 6 BR before there was factory brass available for those cartridges. Remington BR case, 0.080″ Flash Hole, Remington 7.5 Primer. Lapua Palma case, 0.062″ Flash Hole, Remington 7.5 Primer. Next German tested the Wolf .223 primer, an unplated version of the Small Rifle Magnum that so many shooters use. German notes: “This is a reduced flame-front (low flash) primer which has proven itself to be very accurate and will likely see a lot of use in the Lapua cases. With this primer, I couldn’t detect any difference in the flash produced by the small flash hole versus the large flash hole”. Remington BR case, 0.080″ Flash Hole, Wolf .223 Primer. Palma case, 0.062″ Flash Hole, Wolf 223 Primer. Overall, looking at German’s results, one might say that the smaller diameter of the small flash hole does not seem to have significantly changed the length or size of the primer flame front. There is no discernible increased “jet effect”. Share the post "Large vs. Small Flash Holes in .308 Win Brass"